The recent emphasis on prevention in helping couples to avoid marital distress may be limited by lack of participation in prevention programs by engaged couples. The purpose of this study is to understand what potential participants perceive are attractive characteristics in premarital prevention approaches. Eighty-six engaged couples completed questionnaires assessing demographics, personality and the relative importance of premarital program characteristics. The results indicate that leader characteristics, content, and topics such as communication, finances, and problem-solving are the most important elements of premarital counseling to couples. Differences based on gender and risk level are reported. Suggestions are made for more effective recruitment of couples for premarital counseling. Sullivan, K.T., & Anderson, C. (2002). 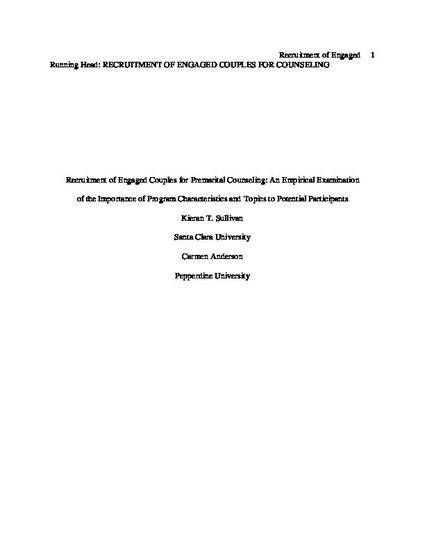 Recruitment of engaged couples for premarital counseling: An empirical examination of the importance of program characteristics and topics to potential participants. The Family Journal 10, 388-397.